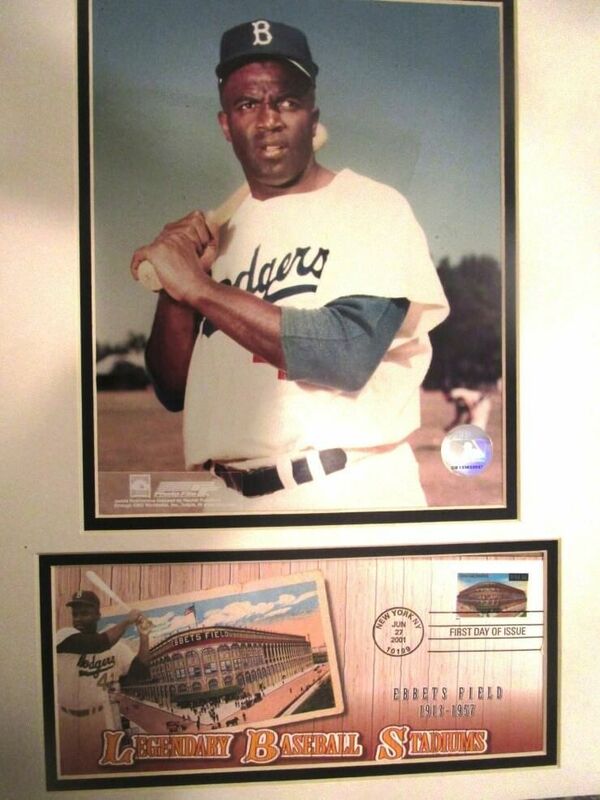 70 years ago today, Jackie Robinson became the first African-American minor leaguer to play in Rochester. 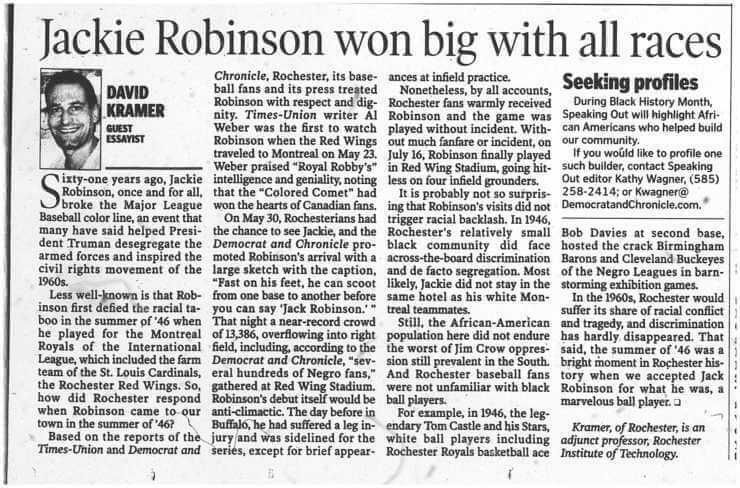 That night, the injured Robinson took infield practice before a near-record crowd of 13,386. In 2008, I wrote essays about the event: one for About Time Magazine and a shorter one for Black History Month for the Democrat and Chronicle. (BELOW). In both essays, I speculated, “Most likely, Jackie did not stay in the same hotel as his white Montreal teammates.” Since then I learned where Jackie did stay. Walt Williams, security guard at the Rochester Public Library, was a teen when Jackie was in Rochester. Walt remembers meeting Jackie at the downtown YMCA. Walt recalls Jackie chatting informally with a small gathering of African-American boys. We both lamented, if only you had gotten his autograph! Four years after Jackie’s infield practice, Rochester saw another historic first. On Halloween, 1950 at Edgerton Park Arena, Earl Lloyd, playing for the Washington Capitols, became the first African-American to play in the National Basketball Association. 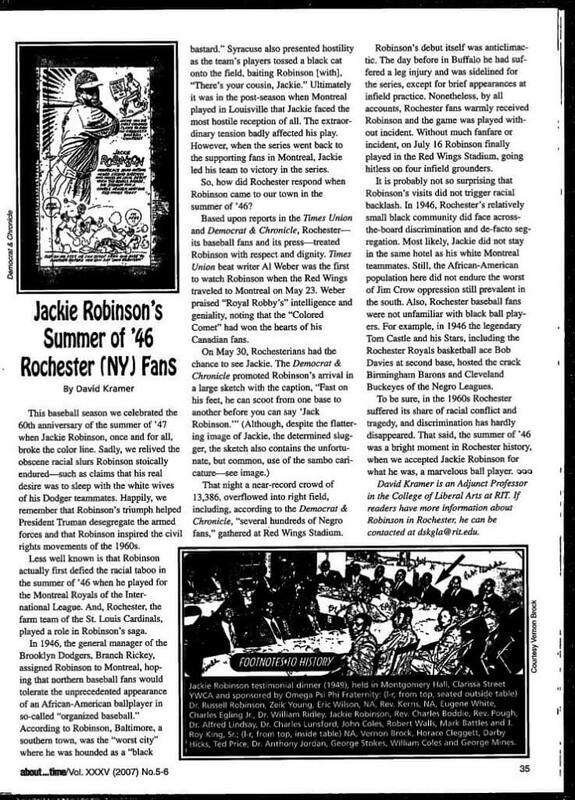 In both cases — 1946 and 1950 — Rochesterians treated the visitors with grace.